The truth is what he makes it. 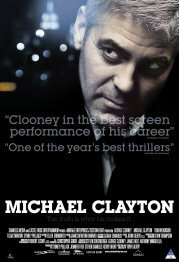 Our hero, Michael Clayton, is a 'fixer' at a top law firm. It's his job to fix legal messes, whatever it takes. A fellow fixer, pained by his conscience, throws a wobbly in court during an important case, and Michael is roped in to sort out the situation. Michael has some issues of his own though, including a large debt that he has to pay off, and a gambling problem. Complicating matters more is the female corporate lawyer from the client, who is determined to nail his friend. The film is one of this year's top Oscar contenders. This is my 'come to court' look. Comments Infrequent use of profanities like ''for Chrissakes'', ''Jesue'', etc may offend Christian viewers and possibly be seen as blasphemous.